FCR third in city lobbying; is spending about documents or about advantage? 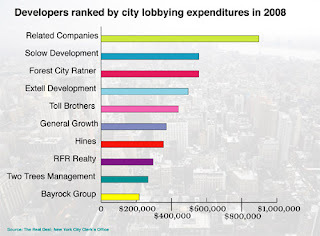 According to research by The Real Deal, Forest City Ratner ranked third among developers in city lobbying expenditures in 2008, spending $555,741, including $500,741 on Atlantic Yards. The Real Deal suggests that "[t]roubled high-profile projects such as Related Companies' Moynihan Station and Solow Development's East River site" generated the most lobbying--and, of course, Atlantic Yards is also delayed. The publication excluded universities in its tally, though Columbia University's spending on its expansion might have made the Top Ten list. "The figures just reflect the true cost [of] when a developer needs to engage government action on their projects," he said. Actually, in the case of Atlantic Yards and perhaps other projects, the lobbying figures reflect not the filing of documents--the project has already been approved--but the effort to shape the deal after the fact. And that should be disturbing, because there's relatively little oversight by legislators and city agencies to explain what exactly the developers are seeking.